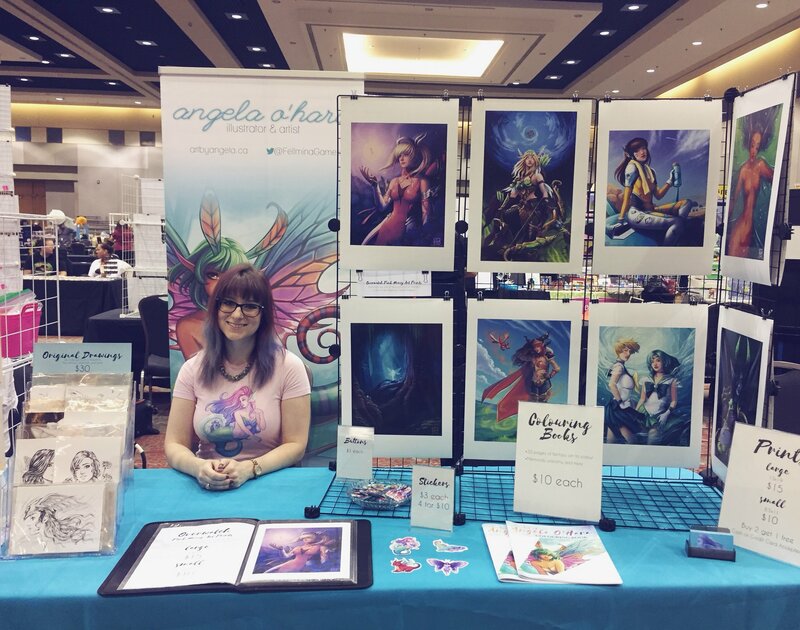 Saturday, September 22, I was at Forest City Comicon in London Ontario! This year, I had my same product line from last year, consisting of prints, buttons, stickers, and colouring books. I debuted 9 new prints, which were warmly received! I also had my Inktober original drawings from 2017 for sale, and I was pleased that there was such strong interest in buying original art. I’ll definitely be planning my Inktober 2018 drawings with that in mind, and aim to draw things that will be popular. I was also surprised and pleased that the non-fanart pieces in my lineup did just as well, and in some cases better, than the fanart. I had comments throughout the day commending me on having original works for sale. My fantasy pieces appealed to a broad range of people, not just fans of specific properties. People seemed excited to see original work, which in turn encourages me to make more of it! Specifically, there was lots of interest in my Magic Forest piece, and in my dragon sticker. I think that for next year, I should endeavor to create a few more pieces with dragons and fantasy environments. Coming up next, I am just about finished a piece for a zine, and then I will be working on Inktober pieces. At the end of October is London Comic Con, and then I can rest!